When looking at diamonds the 4 C's are important however, that's not the only consideration, what makes it more difficult is choosing the perfect combination of CUT, CLARITY, COLOUR and CARAT to suit you individually and your needs. Rest assured however, we at D. M. Soni will guide you through all the details to find you that perfect diamond that will sparkle just right! The first consideration is always the shape of the diamond you desire! The BRILLIANT ROUND has always been the classic and is usually the first shape that pops into everyones head when we first think about diamonds. It is a timeless shape which produces an unrivaled sparkle. 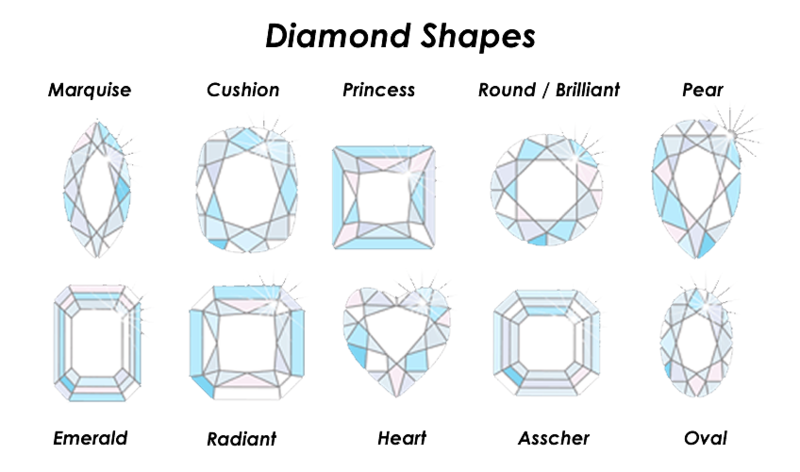 Having said that, choosing a fancy shape is also an expression of ones personality like the PRINCESS diamond is more modern in style as opposed to the vintage inspired CUSHION or ASSCHER cut. Those looking for a sophisticated look can opt for an EMERALD diamond shape while those looking for something a little unusual can try a HEART or OVAL shape. Our advice is simply to try on all the different shapes to see what appeals to you and suits your fingers! The four C's not only describe the characteristics of the diamond but also dictate the price of the diamond. Therefore, it is essential to choose the right colour, clarity and cut combination to achieve maximum sparkle for any budget. Diamonds are measured by their weight on a carat scale where 0.2g is equal to 1 carat. The carat weight of the diamond is basically how big the diamond is. The bigger the carat the bigger the diamond. 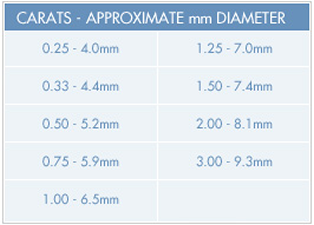 See the chart for approximate diameter in mm to carat measurements. Remember generally the bigger the diamond the more rare it is and so commands higher price! The most common colour of diamonds is yellow. Most diamonds have a hint of yellow and the dimaond colour scale is based on how much yellow is present. The Scale begins at D which is colourless and goes through the alphabet to Z which are yellow and would be considered fancy. Diamonds are graded by comparing them to a set of master stones of known grade. Even expereinced experts would find it difficult to tell a F grade to a E grade without master stones! The difference between 1 or 2 grades on the scale is blurred. For the budget concious colour is somewhere you can go a grade lower without compromising any of the look of the diamond! A diamonds clarity grade defines how internally pure the diamond is. The diamond is inspected by a trained grader and imperfections are graded based on the number, colour, size and position of the imperfection. Generally diamond in the GIA IF to Si1 range are considered "eye-clean" meaning any imperfections are not visible with the naked eye and can only be seen when using a 10x jewellers loupe! In some cultures impure diamonds are considered bad luck! To achieve that clean sparkle we at D. M. Soni only stock "eye clean" diamonds! A rough diamond doesn't sparkle. The sparkle comes from cutting the diamond in the correct proportions to ensure that the light enters the diamond and is reflected completely back out creating that beautiful and intense sparkle! The cut of a diamond is generally described as either IDEAL, EXCELLENT, VERY GOOD, GOOD or FAIR. This is where an ideal cut returns 99% of the light producing a stunning brilliance! The cut can make the difference of a diamond looking clean but not giving out that fire and intensity to displaying a rainbow of colours and brilliance even when the colour for example is not the highest. The Certificate is your guarentee that the diamond you have chosen is the one you are getting. Having a diamond certificate from some of the leading and most trusted gemology labs in the world can also add value to your diamond when compared to an uncertified diamond. At D. M. Soni we always recommend and ethically source our diamonds from suppliers who abide by the Kimberley Process and that have been certified from well recognised labs such as G.I.A and I.G.I. 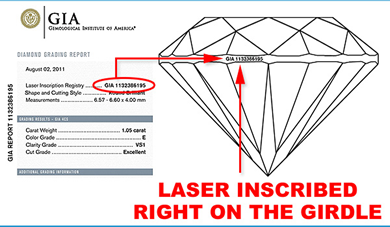 In addition to havng a certificate we always recommend the diamond is laser inscribed with the certificate number for extra protection! In addition we can also offer custom inscriprtions for that personal touch! We hope you feel more confident about buying your diamonds, however we are always available to talk you through your purchase and strive to give you sound advice making sure you get the best diamond for your money! For any questions please get in touch at sales@dmsoni.com or call us on 0116 2660336.